Third night of protest against police murder in Chicago | Fight Back! 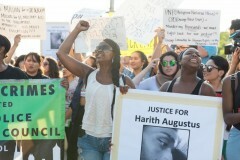 Chicago, IL - Over 500 people rallied and marched for a third night in Chicago's South Shore neighborhood, July 16, where Harith “Snoop” Augustus was murdered by a Chicago police officer on Saturday evening. The protest was called by the Chicago Alliance Against Racist and Political Repression and Black Lives Matter-Chicago. After rallying at the corner of 71st and Chappel, near where Augustus was shot, the crowd went down the street to the office of the Alderwoman Leslie Hairston. Hairston has failed to speak out against the shooting of a Black man who was doing nothing illegal when four cops came after him. 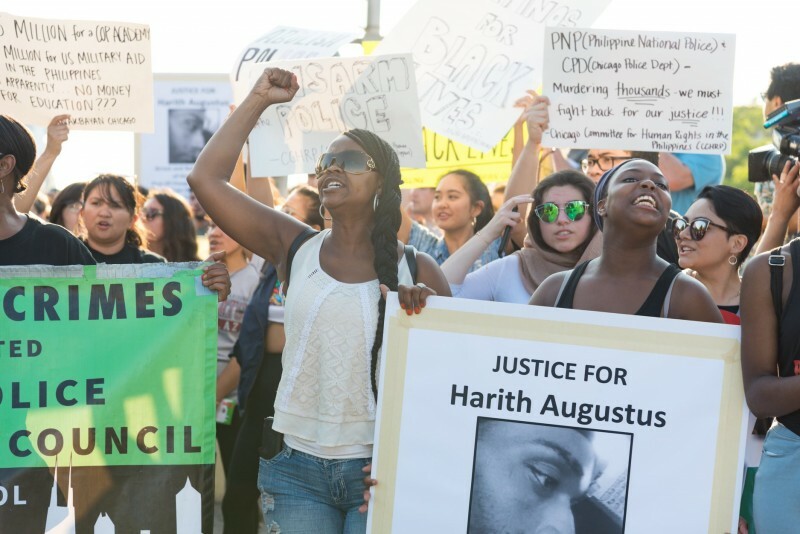 The protesters criticized Hairston and called on her to support the civilian police accountability council (CPAC) legislation to take control of the police out of the hands of the mayor. A young women from the neighborhood talked about the racist discrimination that she has experienced from the police, saying “Black people have always been discriminated against in this country.” Frank Chapman from the Chicago Alliance said, “If you don’t know who the enemy is, I feel bad for you. The enemy is standing right behind me,” gesturing toward the line of officers in front of Hairston’s office. The march then proceeded to the barbershop where Augustus had worked, heard from his coworkers, held a moment of silence, and then collected money to help his family.